Centrally located in the South End District of Charlotte, Alchemy at C3Lab offers several spaces which can be transformed to suit an array of events. This urban, industrial space is a blank canvas for weddings, receptions, corporate, non-profit, performance and other events. The venue offers ample free parking, full bar capabilities, catering, event management support and more. ALCHEMY MAIN At nearly 3000 sq ft, our main event space is ideal for a range of large events from weddings/receptions to performance arts and other special occasions. Capacity for 200 seated for reception (main space), 250+ seated for performance, and 500+ standing. The space includes a private front entrance, green room/bridal suite, a range of bar capabilities and full service catering. ALCHEMY MAIN + PATIO A 1200 sq ft outdoor private patio can be added to the already dynamic Alchemy Main to create over 4000 sq ft of total event space. An excellent option for a combination event like a cocktail hour and reception. ALCHEMY PATIO This 1200 sq ft. indoor/outdoor space is ideal for a cocktail-style event when the weather is nice. Capacity for 150 standing. Includes a range of bar capabilities and full service catering options. ALCHEMY GALLERY Our 2400 sq ft. gallery is best suited for a smaller, reception-style event that requires little additional set up. Capacity for 225 standing. Think corporate cocktail hour or holiday party. The space includes private front entrance, a range of bar capabilities and full service catering. 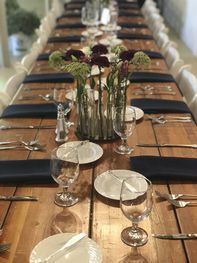 Olde Sycamore is an affordable venue for an office party, rehearsal dinner, wedding reception, or for a get together with family and friends. It is a one of a kind venue. Whether you are planning a formal dinner for 120 guests or hor d'oeuvres for 160, our clubhouse and outdoor patio offers a variety of options. The panoramic view provides the perfect backdrop for stunning wedding photos and our professional staff offers the impeccable service. Olde Sycamore Golf Plantation provides an immaculate setting for your special events. Let us host your wedding reception, corporate function or special event with the comfortable, classy accommodations that our banquet room provides. Many dates are still available. We've recently renovated our clubhouse to provide you with a first-class experience for you and your guests. The Executive Chef will work with you to prepare a menu that will delight your guests’ most sophisticated palates. The Carole Hoefener Center offers the perfect venue for your private events, business meetings, and sporting event. The 3400 square feet multipurpose room has a total seating capacity for 250 people with tables and chairs. 300 capacity max This large room can also be partitioned to accommodate smaller events such as showers and meetings. Customize your room layout for banquets, seminars, or conferences. We also provide small classrooms that can accommodate 25 people --perfect for business meetings or workshops. A recreation area is available for sporting events, large tournaments, or expos. Capacity is 600 so can easily be booked for large events. With banquet style seating it can accommodate 250. We are located in exciting Uptown Charlotte.